To write this piece, I regressed by playing the theme song of Voltes V over and over to transport myself to that time when I was one of the millions of so-called Marcos babies – those born during the Marcos regime, somewhere from 1965 to 1985. I stopped playing the song when I felt a lump in my throat. Voltes V is a Japanese anime TV series dubbed into English that was aired in the Philippines from 1978 until 1979, when apparently, Ferdinand Marcos stopped its broadcast because its violent contents had a negative effect on children. Other accounts said Marcos felt the show’s radical nuances might inflame communism or socialism or spark a coup d’ etat. There were other versions, but by the time it was aired anew after the People Power Revolution that toppled Marcos in February 1986, I was almost out of college and into the adult world. Voltes V tells the story of a team of young fighters who battle invaders and tyrants to free the enslaved. They have an arsenal of weapons. In every episode’s finale, they chant, “Let’s volt in!” while they regroup into the electromagnetic super robot Voltes V, and deliver their final blow to their enemy by slashing it into a “V” shape that beams as the theme song plays and fades out. It was my childhood memory of what was cool on TV. My sudden reference to Voltes V was from Baguio-based journalist, author and poet Frank Cimatu, who spoke before the University of the Philippines Third World Studies Public Forum Series “Marcos Pa Rin! 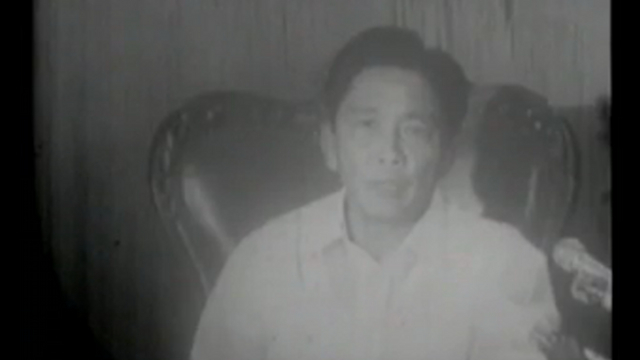 Ang Mga Pamana at Sumpa ng Rehimeng Marcos.” Its forum titled “My Husbands’ Lovers: Ang Pag-ibig at Pagkamuhi kina FM at Meldy mula sa mga Martial Law Babies hanggang sa Kasalukuyang Henerasyon,” recalled the excesses and offenses committed by Ferdinand and Imelda during their reign. Cimatu, like me, grew up in the Marcos loyalist Ilocos region, as he is, like Marcos, an “anak ti Batac” – tracing his parental roots from Batac, Ilocos Norte – while I, though born in Manila, grew up in San Fernando, La Union, where my father was born, and where generations of the Marcoses’ loyal friends, the Ortegas, still dominate politics. The town plaza beside the Catholic school that I attended, with an Ortega as my classmate, is still painted Imelda white. In the forum, UP students expressed their confusion as to why the Marcos babies stayed quiet after their parents and the generation after them have fought their own battles through the First Quarter Storm and through all the radicalism that had them arrested, jailed, tortured, raped, mutilated, and killed. “I don’t know why we were quiet,” Cimatu replied. “I was angered only when Marcos banned Voltes V.” If I were faced with the same question, I also wouldn’t know why the Marcos babies didn’t rant and rave like their predecessors. Perhaps, I would pull a similar stunt by saying I got mad when Marcos added Charlie’s Angels to the TV shows that were banned. Cimatu said he grew up memorizing all the schedules of the cartoons to watch on TV. I grew up knowing how to sing “Ang Bagong Lipunan” and reciting “Ang Panatang Makabayan” right after the national anthem is sung at school mornings, as is done in all schools across the country. Most of my recollections were whispers from my grandparents and parents about what was going on, including that one instance when, while living in a row of apartments across what is now the Don Mariano Marcos Memorial State University, they talked about a strange man in a unit beside ours who pounded his typewriter all day and night, until another strange man came by every day with a goat that grazed a thin grassland where I played with other kids. Not long after, in 1977, the man with the typewriter, Jose Ma. Sison, chairman of the Communist Party of the Philippines, was arrested in Pagdalagan, San Fernando, La Union, a short jeepney ride from where we lived. The man with the goat was a military intelligence officer. We were useful to the Marcoses’ penchant for pageantry. Cimatu recalled that in 1981, he was one of high school students who were given tiny Philippine flags who camped and set up bonfires for the arrival of Pope John Paul II in Baguio. But while peeing and waiting, and unfortunately not holding his country’s flag, Cimatu saw Marcos pass by with the Pope. In elementary school in 1974, I remember waving a tiny flag to the Miss Universe motorcade. In the 1990s, Cimatu extensively reported on the arrival of Marcos’ remains and the flourishing of Marcos cults that worshipped the dead dictator like a demigod especially after his waxed body was laid in a mausoleum in Batac, even reporting the time when “Marcos was melting” because electric power in the mausoleum was cut off due to the Marcoses’ unpaid bills. Remembering this part of our past is both powerful and nostalgic. But Cimatu said this should be sustained, because if not, we’re in huge trouble. Why? “I saw myself in them,” said Cimatu. “But if we remain silent, we have to be wary at the same time,” he said, because already, the Marcoses are back not only through a political party, the 24K that has 30,000 members, but through the social media, with a Facebook account of 25,000 followers, and numerous Youtube videos. The FB page has many photos of the Marcos couple and Senator Bongbong Marcos, obviously projecting himself as a presidential timber in 2016. Journalist Raissa Robles, a correspondent of the South China Morning Post who also talked during the UP forum, said the Marcoses are “reinventing themselves” and this is happening as surveys show that some youth consider Marcos one of their heroes. The Social Weather Stations that tracked public sentiment found shifts about Marcos being a “thief of the nation’s wealth” from unfavorable in 1986 to neutral in 1995 and 1998. “All these are intended to tell their version of history and to cast their father as the greatest president this country ever had,” said Robles. She insisted that mindsets should not change with the switch in the country’s demographics, and since the young are taking their own places, they should be reminded constantly with the truth. UP Philippine literature professor Teresita Maceda told the forum that “minds should not be blunted by long years of authoritarianism” because the truth about the Marcoses needs to be told to this generation and the next ones need further reminding. The people power revolt that nears its anniversary this month “is not enough and it is an unfinished revolution because no one has been punished for the oppression and violation of human rights,” she said. Robles lamented the lack of understanding of the full extent of the Marcos rule because the “people power generation forgot to document all these for future generations. That we are speaking freely now is a testament to how far we have gone in our democracy. That we are still talking about the Marcoses’ probable comeback to center stage shows how dangerously we are regressing and forgetting,” she said. As a reminder to the young audience, Maceda sang the song “Lutong Makoy” that was originally a satirical column in menu form that stated names that remind people of the Marcos era. Robles showed a wristwatch that was a gift to Marcos guests and a piece of barb wire that fenced Malacanang. Both Maceda and Robles called on historians, intellectuals, academics, and writers to come up with books, documentations, historiographies, credible references – online and offline – for the truth to survive and to challenge those wanting to change and erase history. The Marcos babies like Cimatu and me have our own advocacies, too, but we know where we stand in history. I tried doing a Voltes V in college when I joined protests and was beaten up by police while we waited for the UP contingent along Welcome Rotunda in Quezon City. The Voltes V team needs to re-assemble and volt in, after all, and tell today’s generation, who are angered not by the banning of a TV show but by slow Internet connection, to know the past and save the country.